~YOU DON'T NEED A PAYPAL ACCOUNT TO PAY WITH YOUR CARD~ Just click on Paypal payment option and in the next page choose your card. - 1 leaf garland as the one in the picture. Ready to hang with the leafs spaced. 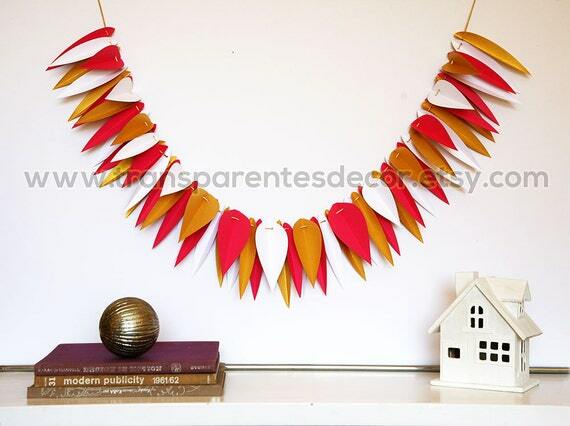 - DIY kit to strung the leafs with the silk thread. As easy as to pass the silk thread through the holes. Pre-creased. Other objects in the pictures are only there for decorative purposes. Length: as it is in the pictures with all leafs without space between each other, 1 yard or more. Leafs: 3.25" the widest, 4.8" shortest and 6.6" the tallest. You can move the leafs along 12 ft. of strong silk thread, spacing them at your like. Hot pink, white, antique matte gold. Variations or new designs. Send me a message. This is not a toy. As any other not proper object has to be out of the reach of children or fire.